Join us for our 4th GIM of the semester on Monday, November 12th at 9:00 PM in Livingston Student Center Room 201B. We’ll be be going over possible supply chain roles you may find yourself in during an internship, co-op, or first full time/entry level position, and where you can go from there. In addition we will be also covering resumes, elevator pitches, and what to do during a career fair in preparation for our Mock Career fair on the 26th of November (GIM 5). Join us for our 5th General Interest Meeting this Monday 11/26 at 9:00 in Livingston Student Center 201B. We will be holding a mock career fair, so members can get a chance to find out more about types of supply chain programs companies have for Rutgers Students and practice their professionalism (attire will be casual). Be sure to bring your resume! De-stress with us on Monday, December 10th at 9PM in Livingston Student Center Room 201B for our last general interest meeting this semester. We’ll be having an end of the semester social with free pizza and also cover study tips, involvement for next semester, and general networking. Big data, data analytics, business intelligence—these are some of the key trends shaping the future of supply chains. With the brand-new Master of Science in Supply Chain Analytics (MSCA) program offered through RBS, you now have the unparalleled opportunity to gain valuable skills, acquire industry-recognized certificates, and get the hands-on experience in big data analytics that employers and recruiters are looking for in next-level supply chain professionals. The MSCA program is a 1-1.5 year, full- or part-time program designed to give you a STEM-quality education that will greatly help you advance any career in supply chain and beyond. Rutgers students can receive unique benefits such as a GMAT/GRE waiver, accelerated graduate degree track, and much more! Learn about the overview and curriculum, the many benefits specifically for Rutgers students, and how you can apply or get additional information! All majors and years are encouraged to come, and refreshments will be served! If you've ever been curious about case competitions—(what are they? when are they? how can I get involved? )—we've got the answers! 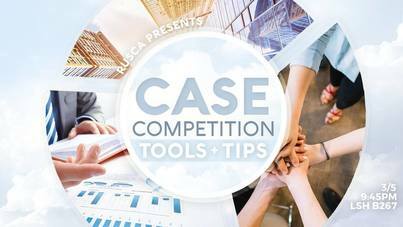 Join us on Monday, March 5th for an all-inclusive guide to case competitions, with tips on how to enter and get the most out of the experience. Case challenges are a great opportunity for you to gain valuable teamwork experience, test your classroom knowledge, and solve real-world business problems, plus they make for a great addition to your resume and skill set. We hope to see you there! 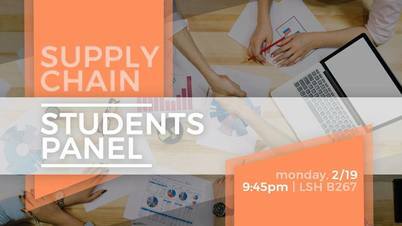 ​Rutgers doesn't get off for President's Day, so come spend the evening with the Rutgers University Supply Chain Association (RUSCA) this Monday for our second GIM, our Supply Chain Students Panel! We're ecstatic to have students from organizations/business fraternities including, but not limited to, RBGA, PCT, AKPsi, and DSP. They will be answering questions regarding their organizations, internships, career opportunities in Supply Chain, as well as any related questions you may have. 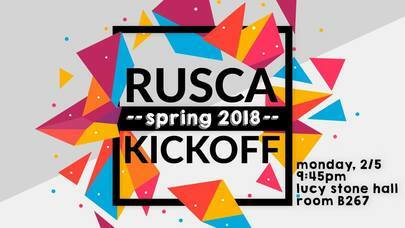 Join the Rutgers University Supply Chain Association (RUSCA) this upcoming Monday to kick off the semester with a meet-and-greet as well as our Spring 2018 event preview! This general interest meeting is open to everyone regardless of year or major, and provides a great chance to get to know our members and learn about all the opportunities in supply chain and beyond. We'll be giving you a sneak peek at our amazing events planned for the semester, with plenty of time for everyone to relax and meet new people. 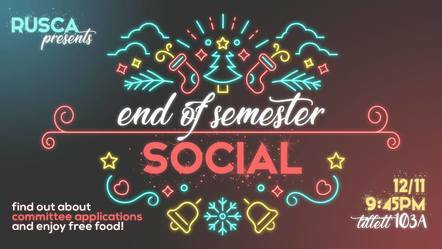 Join the Rutgers University Supply Chain Association on December 11th in Tillett 103A for our end of semester social! We'll be unwinding with tons of delicious food and giving you the first look into our upcoming committee applications. If you've been hoping to get more involved with RUSCA, this is the perfect opportunity: we've got positions in everything from event planning to social media to fundraising, so you're sure to find your fit. Plus, we'll be serving tons of FREE FOOD to give everyone a chance to relax before finals start! We hope to see you there! 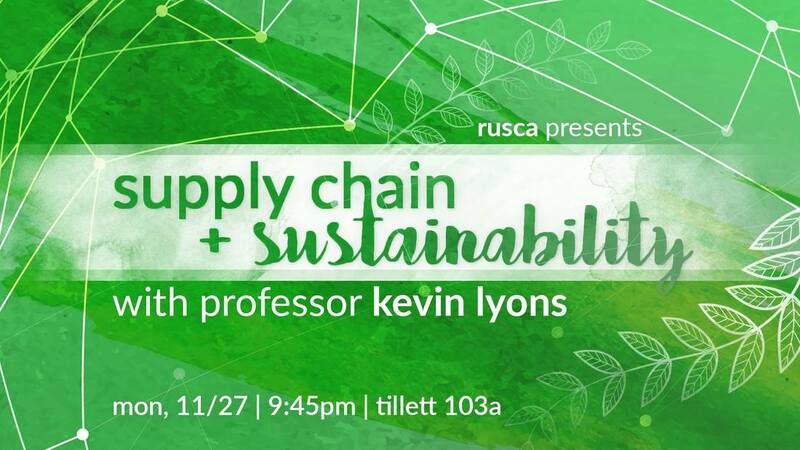 Join RUSCA for a glimpse into the world of supply chain sustainability, presented by Professor Kevin Lyons! Dr. Lyons will be speaking about the latest global developments in green purchasing and 21st-century supply chain practices, as well as talking about the many exciting projects and initiatives that he has worked on. Dr. Lyons is an associate professor at the Rutgers Business School, a leading researcher on global supply chain environmental health, and a recipient of many prestigious awards. Don't miss out on this chance to learn about this new and trending field within supply chain. 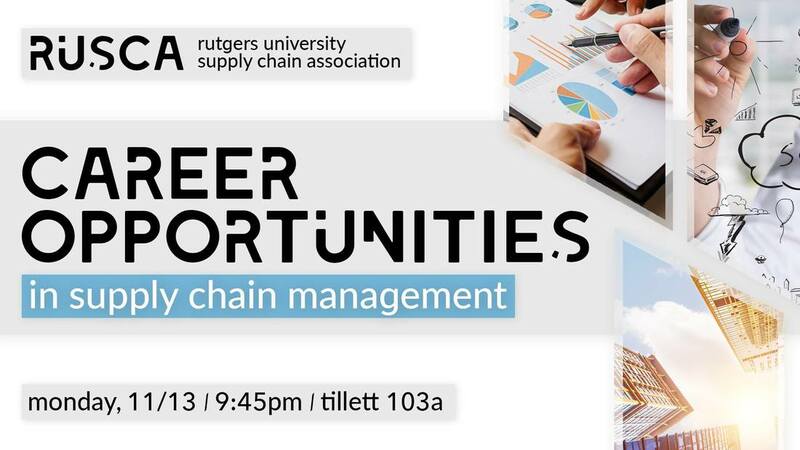 ​Join the Rutgers University Supply Chain Association on Monday, November 13th at 9:45pm in Tillett 103A to learn about the endless career paths in supply chain and discover the right path for you! Explore the incredible variety of jobs, industries, companies, and opportunities that a supply chain major will prepare you for, and find out why SCM is becoming one of the most highly sought after fields. Spring course registration is right around the corner, and RUSCA's here to help you plan your schedule! 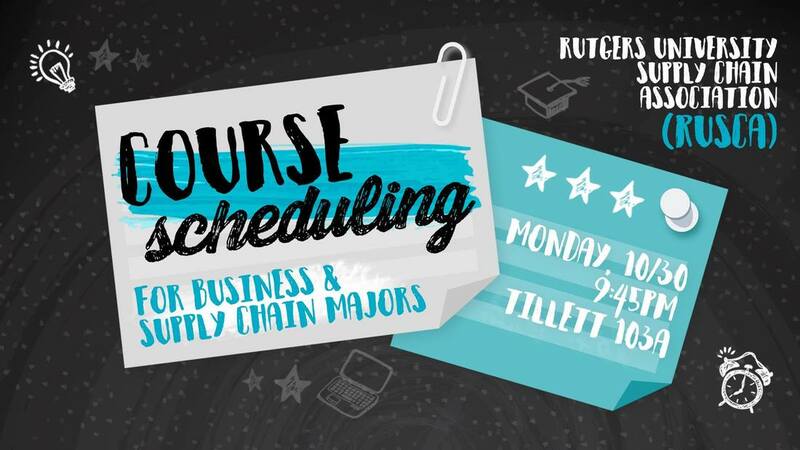 Join us on Monday, October 30th at 9:45pm in Tillett 103A for course scheduling guides and tips. Whether you're a freshman looking at business majors overall, a sophomore considering supply chain, or an upperclassman looking for advice on the best electives, courses, and professors to take, we've got you covered! We'll be doing resume reviewing as well, so feel free to bring a copy of your resume! Ever wondered about the supply chain behind medical technologies, pharmaceuticals, or even your favorite foods? Temperature-controlled, aka "cold chain" logistics, are the backbone to these critical products, presenting amazing opportunities in 21st-century supply chains. On Thursday, 10/26, the Global Cold Chain Alliance will be joining us for a networking lunch, panel, and Q&A event! 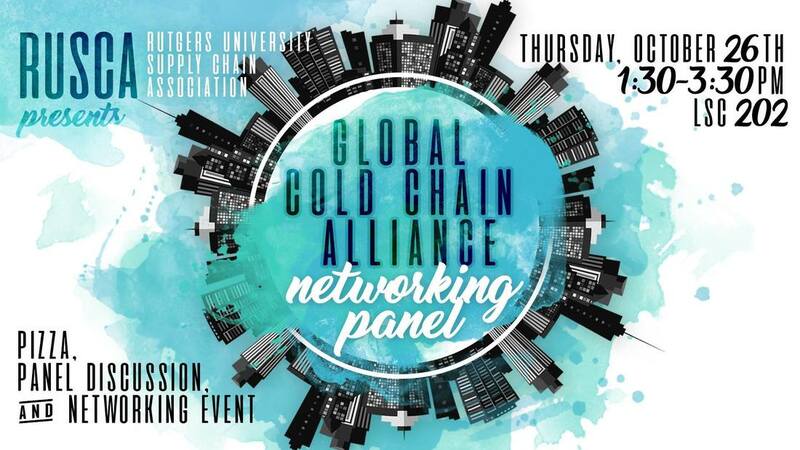 Join us in LSC 202 to learn about the challenges and innovations in the cold chain industry, enjoy free pizza, and network one-on-one with GCCA representatives! Want to develop your professional skills while competing for awesome prizes? 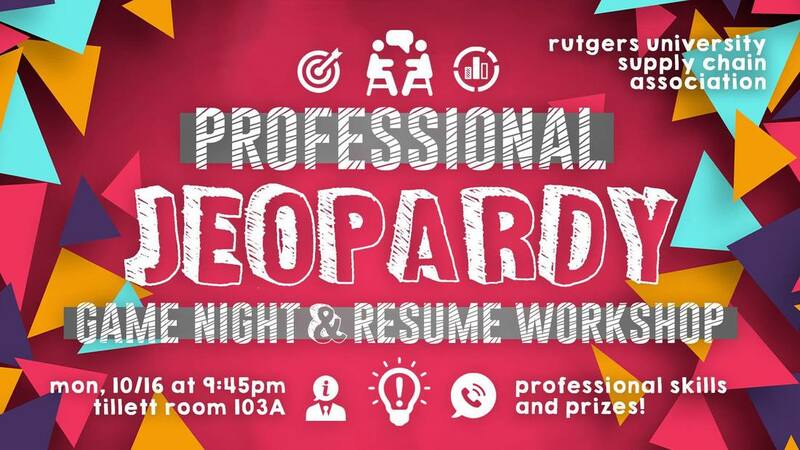 Put your networking, business etiquette, and professionalism knowledge to the test on Monday, 10/16 with an exciting game of Jeopardy, hosted by the Rutgers University Supply Chain Association! There will also be an opportunity to get your resumes critiqued and reviewed afterwards, so be sure to bring a copy! 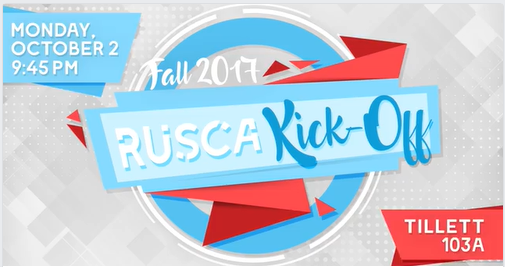 The Rutgers University Supply Chain Association (RUSCA) is back to kick off the semester and prepare you for another eventful year! We welcome you to join our first general interest meeting, where you can learn about RUSCA, an organization dedicated to promoting supply chain and helping Rutgers students gain career and networking opportunities. You'll also get to meet our eboard, learn about the endless possibilities in supply chain, and find out about the exciting events we have in store! All majors are welcome to join. We hope to see you there! 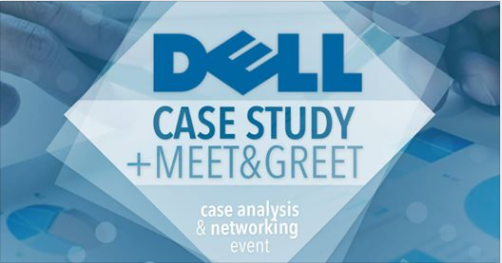 Join BASE, RUSCA, and RUASQ on Tuesday, September 19 from 7-8:30PM in the Business Building South Tower Room 1144 for a case study hosted by Dell! The Dell team will lead students through a recent situation encountered at Dell to help them apply concepts learned in the classroom to real life events. Pizza and refreshments will be served! Business casual attire is required. RUSCA is kicking off the new semester with a presentation by none other than Johnson & Johnson! 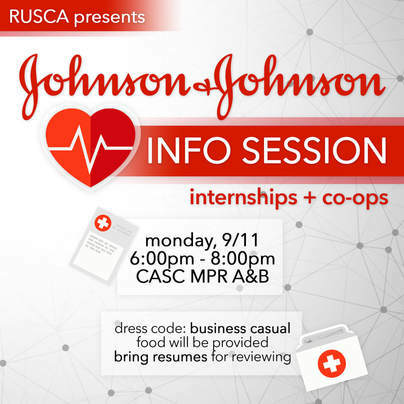 This professional information session and networking event provides students with the chance to learn in-depth about Johnson & Johnson and their many internship and co-op opportunities.